Our software has undergone many changes since we started in 2008. We are very excited to have released a beta version of our latest software in January 2013 at AthenaBridge.com. The brainstorming tool is for answering open-ended questions. The deliberation tool is for facilitating an in-depth discussion of specific statements/hypotheses. The summary tool enables the top participants to highlight the key points from brainstorming and deliberation. The voting tool helps identify the areas of consensus. The platform works well for small groups collaborating on a specific topic, and it works for thousands of participants in an open, public conversation. Conversations can be public or private. No technical expertise is required to start; an organizer only needs to create an account and choose the questions/statements that he/she will open up to the participants. Advanced capabilities (for how to handle large numbers of participants) are easy to understand after watching a short video or seeing it explained in a webinar. Data is easy to export in the form of a PDF. Host a monthly series of in-depth public debates among members about current events or new regulations. Make better strategic plans by collecting input for strategic planning purposes from founding members. Identify areas of consensus on emerging topics where no consensus has yet been established. Open up a participation channel prior to large webinars/teleconferences to make them significantly more interactive. Contact us at hello@athenabridge.com to get started! We’re excited to announce that a research group from the University of Nebraska has chosen AthenaBridge as the technology platform for their $490,000 grant from the National Science Foundation! The title of the project is “Investigating the Role of Distrust in Unauthorized Online Activities Using an Integrated Sociotechnical Approach”. We’re fascinated by the researchers’ approach which will use our software to investigate how far everyday Internet users will go if they had the capability to sabotage comments of others in an online discussion. Collaborating with the team from UNL will offer us some key insights about the social dynamics of online discussions which we look forward to integrating right back into the software. There are also some great opportunities on the technology side– as part of the project we will begin exploring how third-party applications can integrate into the AthenaBridge platform via our API. As we move down this path, software developers will be able to build new visualizations for AthenaBridge conversations, adding to the existing standard and map views and providing more options for conversation participants. Quality time for in-person collaboration is extremely valuable and rare. By creating online participation channels before, during, and after in-person meetings, you can dramatically increase the bandwidth of communication and streamline idea flow within the group. 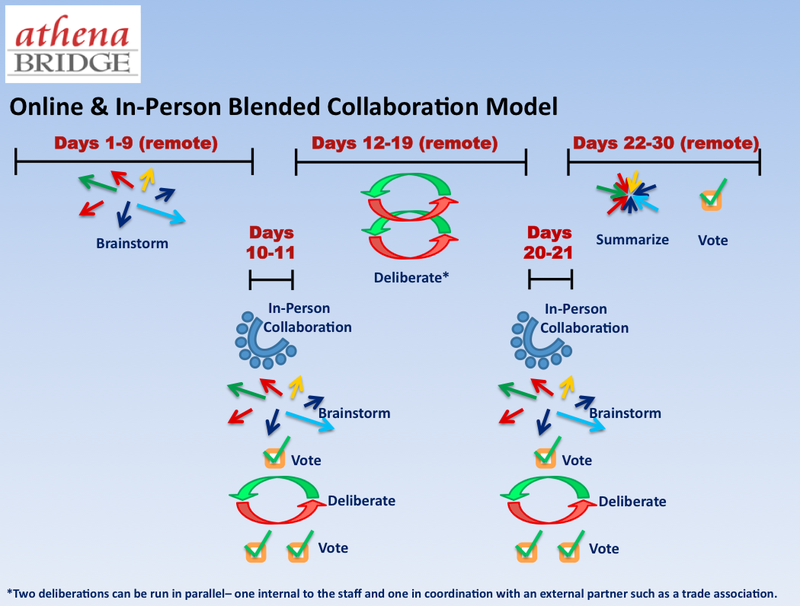 Combine AthenaBridge tools for brainstorming, deliberating, summarizing, and voting to customize the collaboration experience for your participants. From your perspective, what’s missing from the list? It is in these peer discussions that most students do the primary processing of the new ideas and problem-solving approaches. The process of critiquing each other’s ideas in order to arrive at a consensus also enormously improves both their ability to carry on scientific discourse and to test their own understanding. Specifically we make it possible for the professor to create an online conversation where hundreds of students can participate in a meaningful way. The purpose is not to replace discussion forums, but to augment them for the deeper discussions that they were not built to handle. When we’ve taken AthenaBridge software to a dozen classrooms in DC and Philly, we blended online and in-person discussion in 15-minute increments. With some classes, all the students were working alone, and in other classes students were collaborating in groups of four. With groupwork, the exchange of ideas was faster, but some group members were more dominant than others. Nearly all states in the US have adopted the Common Core Standards for Mathematical Practice in their public schools. Implementation is happening over the next few years. Common Core Standard #3– which asks students to be able to “Construct viable arguments and critique the reasoning of others”– is the most relevant one to our work at AthenaBridge. After all, we make our software for deliberation and critical thinking. These critical thinking skills are essential for citizens in a modern democracy, and teaching them shouldn’t be limited to mathematics simply because the Common Core Standards place this standard there. Critical thinking also clearly belongs in the study of history, civics, government, literature, and the list goes on. But how about blurring the lines between subjects further? We are facing societal challenges of increasing complexity that require interdisciplinary approaches, so our educational institutions should reflect that. How about a French teacher collaborating with an economics teacher to create host an online debate or brainstorming session about current events with students from a school in Paris? Sure, it wouldn’t be as easy as learning to order food in French, but it would allow for much more creative thinking– among other things, students would learn facts about a complex economic situation, how to analyze different plans, how to communicate a solution effectively, how to communicate that solution effectively in a foreign language, and what students from another country think about that same topic. The challenges we face at a national level do not fit neatly into categories, and the lessons we teach students might be more effective if they cross over into other subjects and class periods. What are some innovative techniques you’ve seen to blur the line between subjects? What the best ways to get students engaged in a critiquing the reasoning of others, whether it is inside or outside the math classroom? All students have opinions and perspectives that they bring to these issues, and the sharing and sifting of ideas among classmates should elicit the very critical thinking skills that we’re after. Few things encourage intellectual maturation like recognizing and examining the assumptions behind one’s opinions. We’ve seen this first-hand. From our experience bring our critical-thinking software to a dozen high school classrooms, we noticed that students were able to quickly share an opinion about a topic, but they had difficulty backing that opinion up with facts or being able to support it as they were questioned by other students. One possible explanation is that they are able to absorb opinions of others that they hear on TV, at the dinner table, etc much easier than they are able to retain the reasoning behind those opinions. I think that’s generally true for each of us– that we absorb some opinions through our environment subconsciously. We’ve seen that the peer-to-peer discussion model is highly effective in helping students question each other’s assumptions because they are coming from different perspectives and they raise questions naturally. It’s quite exciting to see students learn by coming into contact with new ideas right in front of our eyes. Our software which facilitates this process of in-class brainstorming and deliberation is free for teachers in grades 5-12; pricing for universities is on our homepage; please contact us at hello@athenabridge.com and we’ll be happy to get you started. Now that we have software which can handle robust conversations, we’ve been focusing on novel ways to use it. As we continue to develop business in existing markets, it looks like our next flagship project will be on finding ways to improve the “national dialogue”. Currently the “national dialogue” exists largely in sound bites, and that is problematic. There is much potential for blending online and in-person discussions, distributed across the country. We’ve had some exciting conversations over the past few days with potential partner organizations in Washington, DC. If this is something your organization would like to be involved in, please drop us a note. We will be taking an iterative approach toward creating the conditions for productive conversations by experimenting with different online tools. Aza's prototyping tips from 1 year ago. Your first try will be wrong. Budget and design for it. Aim to finish a usable artifact in a day. This helps you focus and scope. You are making a touchable sketch. Do not fill in all the lines. You are iterating your solution as well as your understanding of the problem. 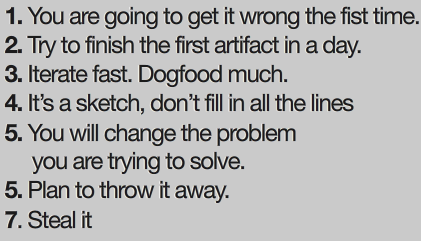 Treat your code as throw-away, but be ready to refactor. Tell a story with your prototype. It isn’t just a set of features. Aza's prototyping tips from one week ago. A few people probably pointed out that he has two #5’s and that he wrote “fist time” instead of “first time”, so there are bound to be future iterations of this same presentation. However, perhaps he shouldn’t correct it– “fist time” is an appropriate mistake because it’s advisable to make early prototypes in a rough and brutish way 🙂 That leads to the first #5 above where the creator will change the problem they are trying to solve only after testing his/her assumptions through the first prototype. Full circle. As a team of four, we have our roots in rapid prototyping and short design-build iterations. But it’s always helpful to get suggestions on how to do it better, especially from experts like Aza. Often one person on our team pushes us to “eat our own dogfood” when the rest of us need a reminder. Using our own deliberation software to deliberate on how to build the software helps us stay focused on the user experience. The problem we first set out to “solve” a few years ago was to create national, citizen-centric debates where people could participate in the Presidential debates in a much deeper way. Since then we’ve changed the problem we are trying to solve (as predicted in #5 above) to creating a platform where citizens can educate each other on current events by exploring the differences in their opinions. As the news industry evolves there are tremendous opportunities for making this a reality using citizen-centric software.